Guinness World Record of being the youngest female solo artist to top the UK album chart in 2003. Avril Ramona Lavigne, popularly known as Avril Lavigne is a Canadian singer-songwriter and actress. Avril paved the way for female-driven, punk-influenced pop music. When Lavigne started gaining publicity, she was known for her tomboyish style. Her wardrobe consists of necktie-and-tank-top combinations. She preferred baggy clothes, skater shoes or Converses, wristbands, and sometimes shoelaces wrapped around her fingers. Thus, she is considered a highlight in the pop-punk and alternative pop-rock scene and often referred by critics and music publications as the "Pop Punk Queen". And she is considered a key musician in the development of pop punk music. Lavigne is the third-best-selling Canadian female artist of all time behind Celine Dion and Shania Twain. Lavigne holds a Guinness World Record of being the youngest female solo artist to top the UK album chart, on 11 January 2003. Lavigne was just 18 years and 106 days old. Lavigne also became the first artist to reach 100 million views on Youtube video for her 2007 song "Girlfriend". Lavigne was also the first western artist to do a full China tour in 2008. Her contribution to the development of pop punk and pop rock music. Almost after 5 years of album break, due to her health issues, the 33-year-old singer Avril Lavigne announced that she would release the first song from her upcoming new album, Head Above Water on September 19. Earlier, Lavigne announced via her Instagram on December 25, 2016, that she was working on new music and will come with a new album. Lavigne has been going through tough times due to her health issues. She was diagnosed with Lyme disease in 2015. It's the most common tick-borne infectious disease in the UK, Europe and North America, and the flu-like symptoms can affect some people for years. Lavigne was born to a father, Jean-Claude Joseph Lavigne and a mother, Judith-Rosanne "Judy" Lavigne on September 27, 1984, at Belleville, Ontario, Canada. Judy is of English, Scottish, and German descent and Joseph of French-Canadian origin. Lavigne has a younger sister, Michelle, and an older brother Matthew. Lavigne used to sing very well at the age of two only. Lavigne was five years old when their family moved to Greater Napanee, Ontario. Her parents supported her singing from her childhood. Her father even bought her a microphone, a drum kit, a keyboard, and several guitars. Her father turned their basement into a studio. Her parents used to take Lavigne to karaoke sessions at the age of fourteen. Lavigne wrote her first song, "Can't Stop Thinking About You". Lavigne in 1999, won a radio contest to perform with the Canadian singer Shania Twain at the Corel Centre in Ottawa. Avril and Twain performed Twain's "What Made You Say That" in front of 20,000 people. Later, Lavigne sang few songs with local folksinger, Stephen Medd. In 2000, Arista signed Lavigne with a deal worth more than $2 million for two albums. Lavigne, after record deal signing, she left school to focus on her music career. Lavigne released her debut album, Let Go in June 2002 in the US. Her debut album reached number two on the Billboard 200 albums chart and at number one in Australia, Canada and the UK. Lavigne became the youngest soloist to have a number-one album on the UK Albums Chart at that time at the age of 17. Lavigne's debut single, "Complicated" became one of the best selling Canadian singles of 2002. It also became one of the decade's biggest hits in the US. Lavigne became the second artist in history to have three top-ten songs from the debut album on Billboard's Mainstream Top 40 chart. Two other songs were, "Sk8er Boi" and "I'm with You". Lavigne won Best New Artist for Complicated at the 2002 MTV Video Music Awards. Lavigne won four of Juno Awards in 2003 out of six nominations. Lavigne received a World Music Award for World's Bestselling Canadian Singer. Lavigne won an International Achievement Award for the song "Complicated" at the SOCAN Awards in Toronto. Lavigne released her second studio album, Under My skin in May 2004. Under My Skin debuted at number one in Canada, US, UK, Australia and Japan. Songs like "Don't Tell Me" and "My Happy Ending" reached top ten hit in the UK, Australia, US and Canada. Lavigne won World's Best Pop/Rock Artist and World's Bestselling Canadian Artist in 2004. Lavigne also won three Juno Awards from five nominations in 2005. Lavigne won Favorite Female Singer at the eighteenth annual Nickelodeon Kids' Choice Awards. Lavigne released her third album, The Best Damn Thing in April 2007. Her third album debuted at number one on the US Billboard 200. Her single, "Girlfriend" from the album peaked at number one in Canada, Japan and Australia and reached number two in the UK and France. "Girlfriend was later recorded in Spanish, French, Italian, Portuguese, German, Japanese, and Mandarin. "Girlfriend" was ranked as the most-downloaded track worldwide in 2007 by the International Federation of the Phonographic Industry. Her album's second single "When You're Gone also reached top 10 in Australia, Canada and the UK. Lavigne won World's Bestselling Canadian Artist' and World's Best Pop/Rock Female Artist in 2007. Lavigne also won her first two MTV Europe Music Awards and Teen Choice Award for 'Best Summer Single. Lavigne was ranked number eight in Forbes magazine's list of 'Top 20 Earners Under 25' in 2007. Billboard named Lavigne the number 10 pop artist in the "Best of the 2000s' chart in 2009. Lavigne released her fourth album, Goodbye Lullaby in March 2011. "What the Hell" was her first single released from her fourth album. Goodbye Lullaby won Album of the Year and Pop Album of the Year in Juno Awards. Lavigne released her fifth album titled Avril Lavigne in November 2013. Songs like "Here's to Never Growing Up", "Rock n Roll" and "Let Me Go" were the hits from this album. Lavigne announced via her Instagram on December 25, 2016, that she was working on new music and will come with a new album. Lavigne co-wrote the song 'Breakaway' for the soundtrack to the 2004 film 'The Princess Diaries 2: Royal Engagement'. Lavigne recorded the theme song for 'The SpongeBob SquarePants Movie' in 2004. Lavigne represented Canada at the closing ceremony of the 2006 and 2010 Winter Olympics. Lavigne wrote the song "Keep Holding On" for the soundtrack to the 2006 film Eragon. Lavigne recorded a song "Alice" for 2010 film Alice in Wonderland. Lavigne's song "I'm with You" was sampled by Rihanna on the track "Cheer(Drink to That"). Lavigne, along with Max Martin and Shellback, wrote a song "Dancing Crazy" for American singer Miranda Cosgrove in 2010. Lavigne made her first television appearance in 2002 in Sabrina, the Teenage Witch. She also made a cameo appearance in the 2004 film Going the Distance. In 2007, Lavigne appeared in the 2007 film The Flock. 2006 film Over the Hedge is considered as her debut in the feature film. She voiced an animated character, Heather. Lavigne also appeared in 2005 film Fast Food Nation. Lavigne entered into the fashion industry in July 2008. She launched the clothing line Abbey Dawn, Lavigne's childhood nickname. Lavigne designs Abbey Dawn herself. Her clothing line was made available to over 50 countries through the line's official website since December 2010. Lavigne then released Black Star, her first fragrance. Black Star won the Best Women's Scent Mass by Cosmetic Executive Women in 2010. Lavigne's released her second fragrance, Forbidden Rose in July 2010 and third fragrance, Wild Rose in August 2011. Lavigne is a hearty charitable person. She is involved with Make Some Noise, Amnesty International, Erase MS, AmericanCPR.org, Special Olympics, Camp Will-a-Way, Music Clearing Minefields, US Campaign for Burma, Make-A-Wish Foundation and War Child. Lavigne attended Unite Against AIDS concert in 2007 and the Clinton Global Initiative in 2010. Lavigne started her own charity "The Avril Lavigne Foundation" aiming to help young people with serious illness and disabilities and also work with leading charitable organizations. Lavigne started dating Sum 41 lead vocalist/rhythm guitarist Deryck Whibley at the age of 19. The couple then got married on July 15, 2006, in Montecito, California. But their marriage lasted only for 3 years. Their divorce was finalized on November 16, 2010. Lavigne then dated The Hills star Brody Jenner for two years. Their relationship ended as well in January 2012. Lavigne began dating Canadian rocker frontman of the Nickelback, Chad Kroeger in July 2012. The couple got engaged in August 2012. They finally got married on July 1, 2013, in France. In the end, Lavigne announced via her Instagram on September 2, 2015, that they had split. Lavigne revealed in April 2015 to People magazine that she had been diagnosed with Lyme disease. For that reason, she had stepped down from her musical career. 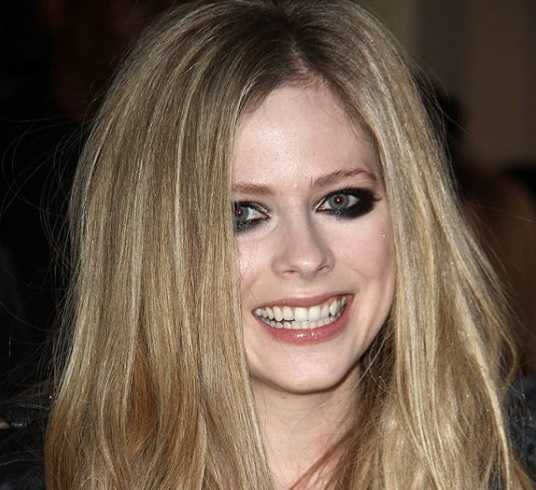 Lavigne also said in another interview that she is undergoing recovery and wanted to increase awareness of the disease. Lavigne has sold more than 40 million albums and over 50 million singles worldwide. Lavigne is the third-best-selling Canadian female artist of all time behind Celine Dion and Shania Twain. Lavigne was ranked number eight in Forbes magazine's list of 'Top 20 Earners Under 25' in 2007. Currently, Avril Lavigne's net worth is estimated to be $50 million. Besides singing, she is also an actress and involved in the fashion industry. Lavigne won the radio contest to perform with the Canadian singer Shania Twain at the age of 15. Lavigne holds a Guinness World Record of being the youngest female solo artist to top the UK album chart. Lavigne became the first artist to reach 100 million views on Youtube video for her song "Girlfriend". Lavigne was also the first western artist to do a full China tour. Lavigne will release her sixth album "Head above Water" after a long gap due to her health issues.